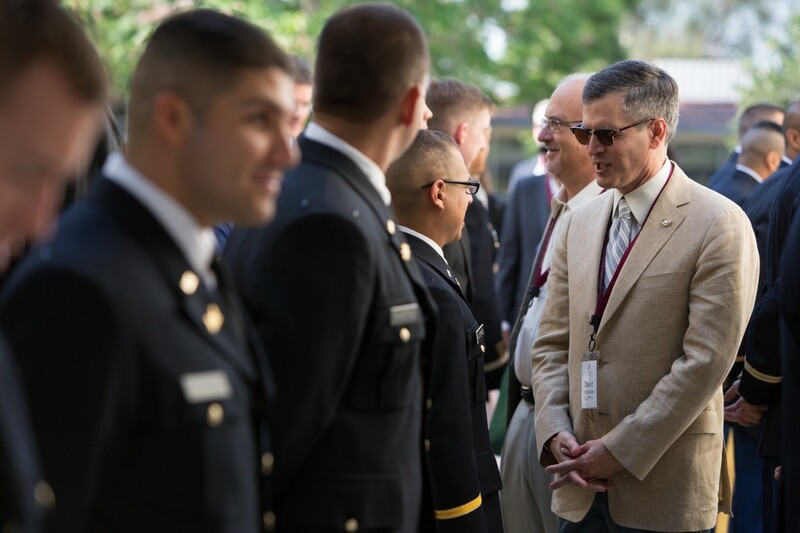 David Mgrublian with ROTC members after the May 2014 commissioning ceremony. The signal that a new chapter in his life at Claremont McKenna was about to begin, recalls David Mgrublian '82 P'11, started with an email from Harry McMahon '75 P'08 P'09. McMahon wanted to see him. Mgrublian didn’t think it was unusual that they should meet. After all, as members of the Board of an ambitious, ever-growing college, there are always important matters to discuss. But Mgrublian says he wasn’t expecting McMahon, then preparing to step down after eight successful years as the Board’s chairman, to tell him he’d been chosen by his fellow trustees as the top candidate to succeed him. This summer, on July 1, Mgrublian started as the eleventh Board chair in the college’s 68-year history. His name joins a list that begins with Garner Beckett in 1946 and includes, in more recent decades, the names of Richard Flamson ’51, Robert Day ’65 P’12, Robert Lowe ’62, Peter Barker ’70 P’01, and McMahon ’75 P’08 P’09. Such admiration, it turns out, is a two-way street between them. “I received a heck of an education sitting next to Harry,” Mgrublian says with a smile. Mgrublian’s new leadership role also coincides with another recent change in the college’s top leadership, the arrival of President Hiram Chodosh, who started July 2013. Mgrublian and McMahon served as co-chairs of the search committee that ultimately brought Chodosh to CMC from the Quinney College of Law at the University of Utah where he was Dean. Mgrublian considers this change in leadership from a strategic perspective. CMC's a family affair: Margaret and David Mgrublian at the 2008 Kravis Prize ceremony. At 54, Mgrublian is the chief executive officer of IDS, which he joined in 1992. He oversees IDS’s Real Estate Services, Corporate Services, and Advisors divisions. He’s also a member of the Urban Land Institute’s Urban Development/Mixed-Use Council. Mgrublian holds an MBA from Harvard Business School. While he regards his new CMC role as being “a resource primarily for the College President and senior staff as issues emerge,” he also acknowledges that it will require him to be more visible than in his previous roles. In 2003, he joined the College’s Board as a regular Trustee and, during 11 years of service, has served on the Board Affairs, Academic Affairs, Research Institutes, Capital Campaign, and Executive Committees. He has worked closely with Emeritus Chairs Lowe, Day, Barker, and McMahon. Mgrublian has also chaired the Board’s Building and Grounds Committee, overseeing the campus’s transformation and working with a variety of stakeholders. That role has been an immense undertaking, especially in light of the continuous projects that are sculpting and shaping the physical appearance of the campus. Projects that he has spearheaded include: Campus Master Plan, Kravis Center, North Mall Renovation, Hub, McKenna Auditorium, Crocker Reading Room renovations, the Parents Field restoration, and exterior lighting and signage upgrades. He also worked closely with Trustees Steve Eggert ’82 P’15 (on the Athenaeum renovation), Ken Valach ’82 (on the Mid Quad renovation), and Ken Novack ’67 (on construction of the forthcoming Roberts Pavilion). Mgrublian explains that his commercial real estate background with IDS has been a major asset in this work, especially the master planning process. Growing up in an Armenian- American family in South Pasadena, the son of a self- taught engineer, Mgrublian excelled in math and social science in high school and was the first in his family to attend college. Today, as progress continues on The Student Imperative, the college’s year-old initiative dedicated to improving the total student experience (financial aid, academic programming, and campus environment), Mgrublian recalls his own dreams of attending CMC and the support that turned this into a reality. He’s also grateful for the special collaborative relationships he experienced once he arrived and decided to major in economics and political science. Mgrublian’s love for his undergraduate experience extended to everything, even— he says with a laugh—to his constitutional law class with Professor Winston Fisk which forced students out of bed early on Monday mornings. As Mgrublian found, such tight-knit relationships on campus would continue after graduation. Involvement with CMC has always been a family commitment. Mgrublian says he met his wife, Margaret, at a large Armenian wedding shortly after graduation from CMC. “The family joke is that we cut our honeymoon short so we could attend my fifth CMC reunion,” he says. His wife has been active with the college’s Center for Human Rights Leadership, their daughter Kathryn is a Class of 2011 alumna, while Madlyn, the couple’s younger daughter, went east to pursue her liberal arts education at Williams. Inspiring tomorrow's leaders: Mgrublian with Pasadena public school students and Program Director Jill Bush this past summer. In addition to funding several family student scholarships at CMC, the Mgrublians also support activities and programs for deserving low- income students attending Pasadena Unified School District schools. Each summer, the couple sponsors a group of high-achieving high school seniors who visit CMC and spend a couple of days on campus. “Margaret and I get great satisfaction out of this,” he says. Educating tomorrow’s civic leaders is what Mgrublian considers central to CMC’s mission. He draws on his father’s service during World War II as an example of the kind of commitment to public service he hopes will be instilled in students. Along with several family photos in his downtown L.A. office, there are photos of Mgrublian with rod in hand, fishing in Montana and Wyoming. When he does manage to take an occasional break in his very tight schedule, Mgrublian says he enjoys the serenity of fly fishing “to clear my mind.” But in general, if he has any time to spare, he says he’d rather spend it on the campus. Ellen Paris is a freelance writer on economics and business for Forbes magazine and other publications.